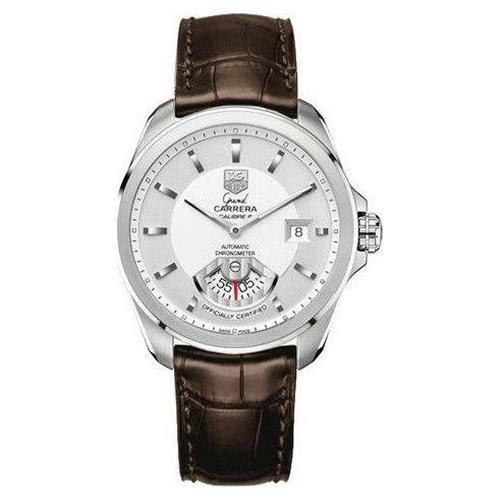 The TAG Heuer Grand Carrera Automatic Chronograph Men’s Watch WAV511B.FC6230 is a stylish, traditional timepiece composed of a 40 millimeter diameter stainless steel case and handsome brown leather strap. The dial of this attractive watch is finished in a silver color and topped with stainless steel indexes at the numeral positions as well as luminous silver-colored hour and minute hands and a fixed bezel. The crystal covering the watch face is composed of scratch resistant Sapphire for increased durability. The date is displayed at the 3 o’clock position while the seconds scroll at the bottom of the watch face between the 5 o’clock and 7 o’clock positions. This stunning watch features automatic self-winding chronometer movement. 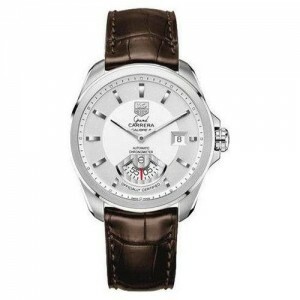 The TAG Heuer Grand Carrera Automatic Chronograph Men’s Watch is water resistant to 100 meters or 330 feet. Its brown strap is composed of fine leather with a subtle crocodile pattern and finished with brown stitching around its perimeter. The deployment clasp is made of stainless steel. The back of the watch features windows so its wearer can see the impressive movement of the timepiece’s inner workings. Retailing for $3700 before tax, the TAG Heuer Grand Carrera Automatic Chronograph Men’s Watch is a truly fine-looking timepiece.